The Le Club Accorhotels program is the loyalty scheme run worldwide by the Accor Hotels group. The program allows you to earn and redeem points at most hotels in the Accor family, including the likes of the Sofitel, Pullman, Novotel, Mercure and Ibis (excluding Ibis Budget) brands. As of 2017, Le Club AccorHotels is changing the way in which status is determined in the program. There are two aspects to this change. The main change is the introduction of Status Points and Rewards Points. Rewards Points will largely be the same as the points that are awarded now. However, it is Status Points that will be required to rise through the levels in the program. Secondly, the program will move from a rolling 12 month period, to a operating under a calendar year. That is, all determinations of status will be bases on your stay history from Januray 1 through to December 31. The program started out life under the name of A|Club, which kicked off on September 15, 2008. At that time, members of the Sofitel specific Sofitel Preferred Guest program were rolled into the new A|Club program. It would be fair to say that they program got off to something of a ropey start. There were problems across the board with points not posting properly, and quite spotty status recognition. This gave it a bit of a bad name in the early days, hwoever, it does seem Accor have done a lot of work in the background improving these aspects of the program. Points more reliably post, and hotels tend to be more cosnistent in status recognition. Le CLub AccorHotels is a free program to join, and can be done in a few minutes online. Once this process is completed, you will be issued with your membership number. From then, you can earn and redeem points at hotels across the Accor family. 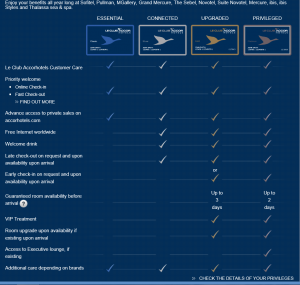 As with a number of programs, there is a points expiration policy with Le Club AccorHotels. Basically, this requires you to earn points once in every twelve month period in order to keep your points active. Points in the program remain active as long as you have activity in a 12 month period. As long as you continue to have account activity, the points will not expire. Hotels that participate in the program include the brands Sofitel, Pullman, M Gallery, Grand Mercure, Mercure, Novotel, The Sebel, Suite Novotel, Ibis, Ibis Styles, Adagio and Adagio Access. There are some non-particpating hotels including Ibis Budget Worldwide, and Ibis generally in China. In Australia, the Novotel Coffs Harbour does not participate. 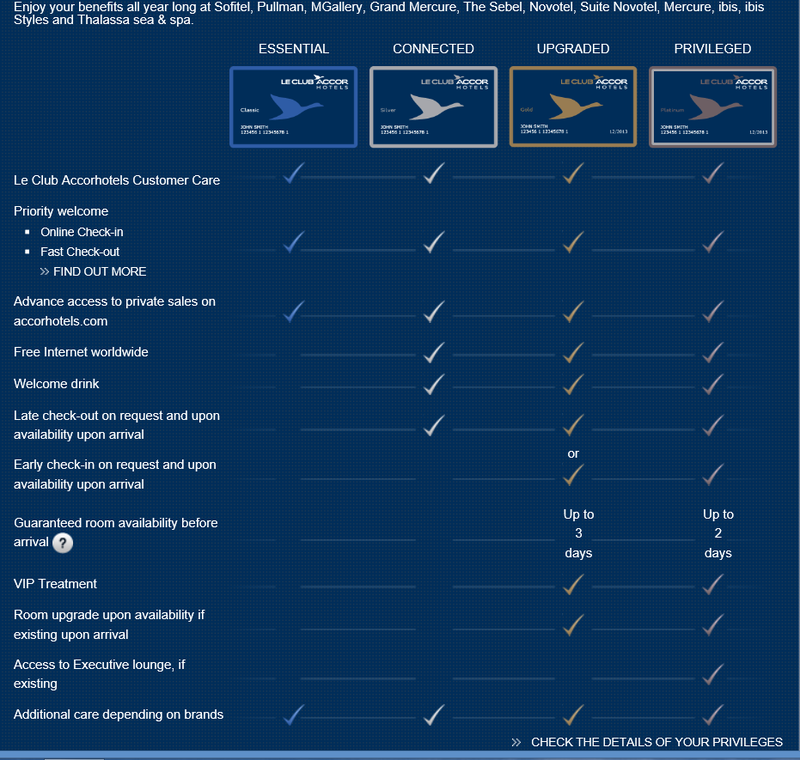 In common with many hotel programs, Le Club AccorHotels has various status tiers. Generally, you can progress through the levels by either staying the requisite number of nights, or earning the number of points required to gain the level. Basically, the requirement to progress levels is based on your earnings over a calendar year. So, your status counter is set at zero on January 1 each year. As you hit each new status level, you will earn that status for the remainder of that year, plus the following year. In the second year, you will need to earn status again to keep it for the third year. On the downside, there is no separate allowance for counting stays toward status. Other programs such as Hilton, have a night or stay requirement. Counting by stays is generally better for people that may have many single nights stays, however, it is not something that works in this program. The classic level is the entry level into the program, and is the level you are assigned when you first sign up to the program. Exclusive Access to Member Sales & Packages with Cash or Points, This may include early access to public sales such as the Priavte Sales that come up through the year. After spending 10 nights, or earning 2,500 Status Points in a calendar, you’ll progress from Classic to Silver status. At this level Reward Points earnings are increased by 25%, moving up to 31 Reward Points for each 10 Euros spent (on most brands). The other main addition at this point is the Free Welcome amenity. In my experience, this has tended to be something like a welcome drink from the bar. Gold level is achieved after earning 7,000 Status Points or spending 30 nights in Accor hotels in a calendar year. Points earning gets a boost up to 50% bonus on top of the Classic level. Platinum is the top level is achieved after earning 14,000 points or spending 60 nights in Accor hotels in a calendar year. Points earning gets a boost up to 50% bonus on top of the Classic level. While this level allows access to the hotels executive lounge, in Australia the Sofitel Hotels in Sydney, Melbourne and Brisbane have exemptions to this policy and do not provide access to the lounges for platinum members. Accor give the following chart to compare the various levels available in the program. When points are posted to your, they are typically posted in two transactions. The first is the base level earning, which in most cases is the 25 points per 10 Euro. In any case, it reflects the earning that a classic level member will achieve. The remainder gets posted under the heading of ‘Points Accelerator’. This is the difference between the points a base Classic member would earn and the number of points that is applicable to the status level. For example, for a Silver member staying at a Novotel, the accelerator would be 6 points per 10 Euro. The significance of this apparent when Accor run promotions such as double, triple or even quadruple points. In most cases the bonus is paid only on the base Classic level of points, and does not include any earning posted under the ‘Accelerator’ title. The Le Club AccorHotels program is a little unusual in the way redemptions work. Most other programs offer reward nights. In contrast, Accor publishes a value for the points in the program – 2,000 points has a value of 40 Euro. This is different to many programs where there is no direct relationship between points and a specific monetary value. The original option that was available in the program was to redeem points for vouchers that could be used in the hotels. While various currencies have been available over time, at the moment, Euros is the only redemption option available. The vouchers can be used at hotels as payments for the room. There is a bit of a gotcha with this, in that any conversion from Euro to the hotels currency is done at the hotels prevailing exchange rate. These are typically not particularly attractive rates, with the hotels clearly taking a fairly significant cut. An alternative method of using points to discount room rates is to apply the points at the booking time. Again, 2,000 points is good for 40 Euro. However, in this case, it is Accor themselves that perform the currency conversion using an internal rate of exchange. This is typically better that would be achieved using the vouchers. Another alternative is to transfer points to another program. Le Club AccorHotel points can be transferred to various airline programs. For example, they can be converted to Qantas Points on a 1 for 1 basis. Points can either be transferred manually (generally in blocks of 4,000 points), or the account can be setup to automatically transfer across as they are earned.